Is Playstation Vue 50% Better Than Sling TV? After about a year of limited geographical release, Sony has slimmed down their Playstation Vue over-the-top (OTT) television streaming service to accommodate nationwide availability. Specifically, to get this done, the new packages do away with the locals (ABC, CBS, NBC, FOX) as those require market-by-market negotiation due to affiliate forces. In my household, we could definitely cut the cord. Between a service like Sling TV or Vue, plus Hulu, Netflix, and Amazon Prime, augmented by the occasional HBO Now or Showtime subscription, we’d have the vast majority of programming needs met. However, since our TiVos are a hardware sunk cost and Verizon is only charging us about $20 for television services, beyond broadband, I’d prefer to keep the more reliable and more easily accessible “cable” content. You? The cost difference for my cable+internet package vs. just cable is $10/month (Comcast Blast+, 150mbps down, limited basic + HBO, customer owned equipment for modem and tivo box). So $69.99 vs. $59.99, but obviously that does not include Amazon Prime or Netflix. I’d definitely get some more channels by cutting the cord, but I don’t know how much I need HGTV or VH1, and ESPN would just be a waste on my subscription. You should also note that the new $30 package from Playstation Vue, besides offering all the stuff you point out above, also includes on-demand access to network programming from ABC, NBC and FOX, even though it does not include their live local affiliate channels. Given that those are the big three nets covered by Hulu, I don’t really see why one would even need to pay the $8 for Hulu on top of PS Vue (unless for the small but growing list of quality originals from Hulu). If you really love your CSI, though, maybe spring an extra $6 for CBS All Access. Honestly, I think this is a great deal from PS Vue. I commented on another thread here recently that I could see Sling TV selling their current package with cloud DVR capability added for maybe $28/mo. total. But not now, not with a much more robust channel package from PS Vue, plus cloud DVR, plus 3 major broadcast nets on demand, for only $30. I think this is going to steal away a lot of Sling TV subscribers who already own a PlayStation or Fire TV. This is a good deal for cord cutting sports fans. FS1-2, NCBSN, and ESPN1-2 all included in the $30 tier. This covers most of the sports that I watch. Add the cloud DVR for TNT, USA and broadcast networks and it is great. I’m currently in a $35 package from the cable company that goes to $80 when the promotion stops. I’ll be switching to Vue for sure. I just finished my 7 day trial of PS Vue. Cloud DVR allows you to record most channel programming and more than 10+ channels at once. Recorded content is available for 28 days. Access to VOD usually current season and some only the last 5-6 episodes. Ability to access programming on various devices and TVs. Some programming must be watched live or has inability to skip ads on VoD content. Content cannot be accessed away from home on mobile devices like iPad. Maybe when some of these issues are solved I will reactivate my account. The first three logos are “ABC OnDemand,” “Fox OnDemand” and “NBC OnDemand”. If I had to guess, I’d say it offers the same thing that their authenticated platforms (e.g. Watch ABC, Fox Now, etc.) offer (which I think is basically what Hulu offers): the last 5-6 episodes with forced commercial viewing. Content from ABC, FOX and NBC will be available only as on-demand content in the Slim multi-channel plans. Most on-demand content will be available within 24 hours after airing. CBS live and on-demand programming will be added to select TV markets at a later date. Thanks for the review, Dave. Tim, I’ll probably give the trial a run in the near future. So what happens when CBS hits? Do plans go up by $10? Hm. Regarding BBCA, I wonder if the pricing just isn’t favorable. Verizon’s two base FiOS tiers, for example, do not offer it. Guess I’ll be shelling out for Orphan Black this season on Amazon. Maybe they do raise rates in those markets where CBS live and on-demand is eventually added — I’m sure those are markets where the CBS affiliate is network owned & operated, and possibly the additional markets where live local streaming has been added to the CBS All Access platform. Given that CBS All Access as a standalone subscription is only $6 per month, I couldn’t see the price of these PS Vue Slim plans going up more than that. Although, through the magic of bundling, I’d expect the price hike to be a little less, $5 max (if there’s a hike at all). The pricing in Los Angeles that includes the Live/On Demand programming for CBS, NBC, ABC, Fox and My13 is $40/$45/$55 depending on the tiers. So a $5 increase for somewhere in the middle is probably a good guess. When I first saw this I jumped all over it. Then I remembered I have three Tivos and use them for OTT. Then I remembered I really miss my NASCAR and the wife misses Food Network. Then I saw no BBCA. Sigh. Give me Dr. Who and I’ll probably do it. $50 for a Fire stick just to watch a trial, though. The live major networks (minus CBS) will be available On Demand usually within 24 hours of viewing. However you cannot FF through On Demand or Start Over programming. (You can FF through anything you’ve ‘recorded’ – but you cannot record the network stuff as it is only available On Demand.) So you get the shows but it’s like watching them in 1982. I don’t watch On Demand on my cable box at all because I’m not going to be limited in regard to FF through parts of the show or commercials. On the major plus side they give access to the network apps of over 50 of their channel offferings. This is something Sling does not do as I understand it. So if you get TCM in your package you can use the Watch TCM app on whatever platform you like. Anyway – due to the FF thing I’d totally keep Hulu Premium (It’s a much nicer service without the ads for the extra $4 or so a month). Too bad CBS all access also insists on showing ads. They can keep it. I’m not paying them and watching ads. One option – particularly if you have some way to record already – would be to get the barebones TV package from your cable. They usually offer a package for like $10/month which only includes like the base 18 channels or something. So all the locals and pbs and a few others. DirecTV insisted that we pay over $100 per month for “basic” service on 4 TVs, despite an agreement a few months earlier for $65 per month. They wouldn’t budge, and seemed fine with my threat to cancel. So I did. We cut the cord and went with a central over-the-air DVR called Tablo with an inexpensive 2 TB USB drive (virtually *endless* recordings! ), subscriptions to Netflix, Hulu Plus, and the Amazon Prime Video already included with our existing Prime service, free streaming options like CBS Online, and Sling TV for sports. We have the least expensive Internet tier from our local cable company, which is more than enough to handle multiple HD streams (probably not 4K, but I still can’t tell the difference between DVD and Bluray, so I don’t care). We tie it all together in a unified interface with a Roku 3 (sweet!) in every room, with even *more* apps (can you say $1 online movie rentals from VidAngel? more convenient and slightly less expensive than even RedBox, another of our favorite video sources), and we now pay only about $30 per month total for a massive selection of video. And this actually works *better* for us than DirecTV. When we tailgate, we take a Roku 3 and use either local wifi or our LTE connection to watch a variety of sports live, no mobile satellite dish required. Netflix keeps our current binge series positions separately for each user (wake up, Hulu! :-D ). We can each watch different sports on our phones and tablets while the family collectively watches a movie on the TV (yeah – we’re the over-videoed generation). And when traveling, the Rokus, tablets, and phones take our entire collective entertainment system with each of us – even if we all travel to different locations. Everyone’s needs vary, but we’ve found that cutting the cord has expanded our choices, turned TV fully mobile and mostly individualized, and halved our monthly cost. You might look into your options if this sounds appealing to you, too. If folks are already subscribed for X, would they raise the rate when CBS “is ready?” Or require it of new customers? Or just leave it be? Hm. Mike, for $68/mo I can keep my 50/50 Internet and get all the local via FiOS and since I already have TiVos… But, like I said, for about $20 more I get a decent amount of cable and other than declaring “I cut the cord” I can’t really rationalize it. Adam is anxiously awaiting their Apple TV app, announced at CES and going into beta any day is my understanding. Dave: In your position at the rates you’re paying I see your point. I can’t get anything like those prices in my neck of the woods. I’m paying $140 from time warner. That’s their six tuner DVR, the usual cable package plus HBO, and 30/5 internet. And that’s only because I called and whinged at them long enough to get that deal for 12 months. I also get a phone with that but it’s not even plugged in. It would have been more expensive without the phone. If I dropped the cable completely (and phone) then just the 30/5 internet would probalby be around $70 month I’d guess. Yeah, but that’s not the rule. I’m paying $115/month in my second year on a TWC triple-play promo, regular price around $175/month (includes all fees/taxes, plus CableCard/TA rental). But 3MBps down internet is only $15/month, non-promo. With two lifetime Tivos & my large (8-bay) attic antenna I could easily return to OTA TV (stream Amazon/Hulu/Netflix in SD, possibly lower-bitrate HD). (I’d port out my home phone to Google Voice & buy a VOIP box). Should I move to the Carolina outer banks, or the California central coast? Factoring in everything? My tv bill just crossed over $100 (content no internet) and I want to cut the cord, but I like TiVo too much to cut the cord. What I really want is a skinny bundle from Cox, or an OTT app for TiVo that allows me to integrate OTA with the streaming service. Sling has most of what I want except for a few channels like CNBC. Until Amazon, Apple or Netflix offer offer OTT, I am not interested. Sling and Sony are not capable of offering a reliable service. I ecstatic with my HD Homerun Primw w/ channels app and Concast. No rental fees. Bill, it could be the rule in locales where there’s competition… I’ve been at this address for 3.5 years now and I’m pretty sure our Double Play has been at or under $100 the whole time. As long as I’m willing to sign up and renew for 2 year intervals, decent pricing is available via the standard online ordering. Unlike Comcast’s promotional packages which do seem to expire. Obviously, my pricing does go up higher the times when I turn HBO or SHO on. Although this last month, we paid Showtime directly OTT without risking Verizon billing issues. Dan, it’s still early days. Reliability will improve. Although, by the time it’s really good, we’ll all have broadband caps … because the cablecos won’t go quietly. Yeah, the telcos are much more reasonably priced on content than cable companies. Unfortunately, most cable broadband customers have to pay a lot more than $20/month extra for 200-odd channels of standard cable. Which is why Vue is more attractive to those users. Especially when it offers multiple concurrent streams. What’s stopping you from cutting the cord and keeping your Tivo? We cut the cord a couple years ago, and still use my TivoHD for recording over-the-air programming using an antenna. We use Roku for streaming (Netflix, Amazon prime, etc). Works great. Comcast double play with 100/10 Internet, HBO, SHO, Max, and Starz for 139/mo on two Lifetime TiVo Roamio 6 tuner models and three minis. I only pay $1.50 for the second cable card and no outlet fees. If I dump TV, I could save about 80 per month, but for now I am good and will let OTT shake itself out for now. What I,m curious about is how Vue will deal with the real time slams, Game of Thrones, certain sports events, Walking Dead season premiere, etc. Basically the thing that causes OTT users to run screaming to the internet that there 20 dollar streaming service is not perfect. This is where cable/ telco/ and satellite still hold the edge. And of course OTA if it’s major network programming. Thanks to AT&T we’re cut cutters. U-Verse cut the cord for us, declining to send technician #5 and waiving our ETF fee. So far, I’ve picked up 75mbps Xfinity for $49.99 a month + taxes/fees. I’ll guess that will be $60 a month, leaving $105 a month to play with since our AT&T bill was $165. I already have Netflix, Amazon Prime and Hulu Ad Free but don’t count that towards the cost, since we were paying for that already. I’m in hotels 50% of the month, and most of what I watch is there, so it was working out well, plus the kids love it. The calculation is what else do we need? I’m beginning to think Playstation Vue is the answer. I watch MLB but already subscribe to MLB.tv because I root for two out of market teams, so that’s covered. I follow the local NHL team and they are on the local Fox Sports channel Vue offers. Not a NBA fan. College Football I watch SEC, which is well covered by CBS and the SEC channel. Pro Football I expect to get OTA and Tablo (why is it out of stock EVERYWHERE?). I watch MMA, which is on FS1 (VUE) or PPV (irrelevant). I watch some Soccer, but not much. BeIn is on Vue, and there’s Fox’s premium soccer plan if I really change my mind and want more. Shows that I watch but not on Hulu, Amazon Prime or Netflix include a couple of things on CBS (Vue), USA (Vue) and FX (Vue). So looks like for the price of a Tablo and a decent antenna, plus Vue, I’ll save big bucks. Thanks AT&T for kicking us out! Any thoughts on OTA? Tablo seems compelling at the price, as Simple.TV seems half out of business, TiVo is just too much per month and lifetime is a rip if all you care about is OTA. ChannelMaster has a great product, but by the time I add a WiFi dongle and a SlingBox, I could have just bought TiVo lifetime already. Scott, yes you can sign up with a FireTV. I suggest the box and not the stick so you can hardwire the ethernet for better, more reliable streaming. I have the Fios triple play with 25/25 internet, phone service, and their Ultimate TV package (basically every channel including all movie premiums and subscription channels like NFL RedZone) for $110 a month. Even with the ridiculous $5 charge for a cable card and taxes and fees I’m paying a total of $126. My contract expires in early June and I’ve looked and I can keep my current package for $5 less a month, so $105. 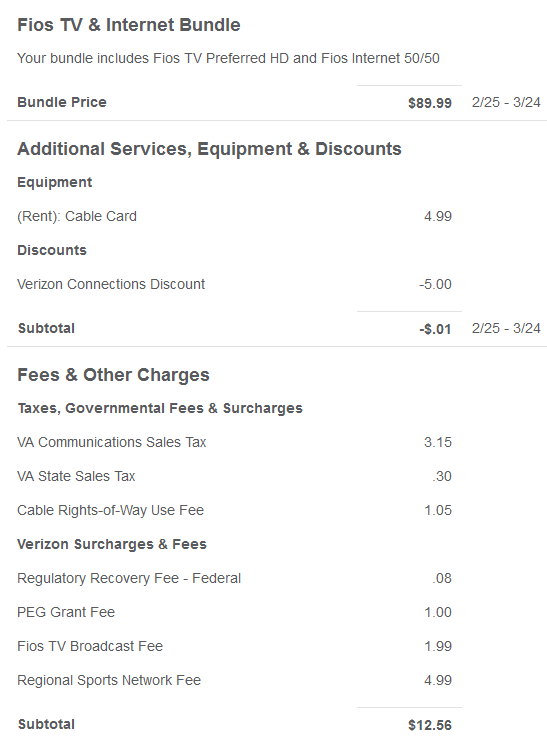 Granted I have a $10 discount through my employer and Verizon’s connections program (or whatever they call it), but phone and internet without TV wouldn’t be much less a month. I think I’d be paying about $70+ a month for phone and internet so in essence I’m paying $35 a month (or $40 with the cable card) to have access to every non-pay per view channel they offer. That seems much much better than any of these OTT offerings. In addition, a 28 day storage is nowhere near sufficient for recording. I have shows on my DVR from over a year ago that I still realistically plan to watch. Why not just offer a limit on storage as opposed to a time limit? A time limit seems kind of arbitrary. Thanks HarperVision. I did just that last night on the 7 day trial. Incidentally, it seems they aren’t scaling down networks in areas where they have them… in the Miami-Ft. Lauderdale area we get NBC, CBS, FOX live, and ABC On-Demand. So apparently the on-demand piece is something they must have a national agreement for, and works until they get a local affiliate agreement in place. So for me, 75mbps internet was $61.50 per month including taxes. So I bought the $55Vue plan, and I’m sitting at $106.50. Adding in Vue’s DVR capabilities (28 days is plenty for me), and my existing MLB.tv, Hulu, Amazon and Netflix and I’m pretty much good to go. Debating a Tablo, but honestly, I’m pretty sure I can live without live ABC. Vue’s interface really puts Sling to shame. And once they get an Apple TV App, we will finally have a wife-friendly one input system… amazing! For now, it’s two inputs, Fire TV and Apple TV. Considering we were at $165 with U-Verse, for less bandwidth, I’m pretty happy. daniel, if it takes more than 28 days to watch a show u dvrd that u wanted to see than u really werent all the excited and interested to see it in the first place..right? dave, I save entire seasons or half season and watch months later. For example, I accumulated all of Flash and caught up during the mid-season break. I’ll DVR all of the Americans, starting tonight, and binge once the season concludes. If Hulu or On Demand, and its respective licensing were better, DVR wouldn’t need to exist. Not only will I binge-watch a season of a show, 3, 6, or 9 months after it aired. But I’ll also save multiple seasons of especially favored shows to be able to re-watch. This works in so many different senses. – First, you’ve got windowing concerns which a DVR removes. – Second, you’ve got superior PQ, at least with my MSO, over OTT offerings. – Third, you’ve got the superior playback/navigation controls of a TiVo over OTT. Which is not a small matter at all. I agree! But that’s why I love DVR’ing! Life’s too short. So when I waste time watching teevee, I only want to watch stuff I actually want to watch. And having a nice, extensive, consistent, and extensive catalog at my fingertips mean that when I want to watch teevee, I’ve always got something good in the queue. Life’s too short to do it any other way! Yeah I agree Chucky, but I am always able to find [i]something[/i] to watch whenever I sit down to watch teevee, be it with my TiVos, DirecTV, OTT, VoD, etc. We recently moved to a new house and went down to Comcast internet only (150Mbs). I was specifically angling to drop the Comcast tv subscription and go to Vue since I got a 1 year 40% off promo code at the Playstation Experience conference back in November. We have a Tivo Roamio and Mini on antenna and just use Vue for the cable channels we used to watch on Comcast. It is nice not having to pay the extra fee’s and taxes that Comcast tacked on. We live in one of the original markets that Vue launched in (SF Bay Area) so can not get the slim package, which I would surely switch to. I am assuming that everyone will eventually have the option. So far the service has been rock solid with great picture quality. The Cloud DVR and On Demand options are a good alternative to Tivo, though not as good of a substitute. We’ve been using it for a month and so far have only used 200GB of our unenforced 250GB data cap. Google fiber is coming to the area so I doubt it ever will be enforced. Things are looking good for chord cutters. CBS does not have enough content to justify Netlix pricing. They are smoking wacky tabbacy. Cable is never just $20 even when that is the “price”. I was paying nearly $15 in fees and taxes in addition to the so called price. Still cord cut after 9 months and I am missing some of my favorite shows but I don’t need it. With a single salary, a 401k in place of a real pension (I pay), and now almost no severance if I get laid off despite 20 years of service, I need to save, save, save for the worst. We don’t get CBS and barely get PBS on our antenna and our Tivo ends up recording mostly network trash but there is no disposable income left. And the IRS says I am “rich”…snort. Something has to give. I am reading alot more….god bless bibliosocialism (i.e., the public library). The era of pensions is long gone… I’ve indirectly given my employer 15 or 16 years of service and am similarly investing in my own retirement fund. Looks like I’m paying $12.56 in taxes and fees, with at least $7 what I’d call hidden bs TV-related charges. So, yeah, there is something more beyond the $20 a Sling TV charges, by comparison. Dave, you have that BS regional sports and broadcast fees. Somehow I’ve missed getting hit by those so far. I’m still at $110 (including a $10 connections discount) for 25/25 internet, phone, and the ultimate TV package. Total bill with cable card is $126. It looks like that should fall $5 a month when I renew although I hope I don’t get hit with that $7 in bs charges. But keep in mind that you’d still have some of those taxes and fees if you were internet only. The point is that I’m probably at about $45-$50 a month total in TV after subtracting what phone and internet would cost on their own. I’m totally fine with that considering that I get all the premiums and NFL Redzone. As far as the 28 day storage limit, I routinely store shows to binge watch. The Americans is a great example. It’s my favorite show on TV yet I usually wait until the season is over before I watch. It’s just a much better experience that way. I also do that with all the new shows. I wait until I know if it’s getting renewed. I have no issues waiting for a better experience. It’s the same reason I record sports and avoid spoilers when I’m out or dealing with my kids. I’d rather wait and enjoy it more later than rush and enjoy it less. Plus it instills discipline. I’m totally fine with the 28 Day DVR storage. If I don’t watch it in that time I probably won’t get to it. Besides, those shows will inevitably show up on Netflix, i.e Better Call Saul, The Americans, etc., so I’ll catch it then. Using a PS4 and Fire TV Stick for Vueing BTW. Kids use iPads and phone in combination with the former. @Marcus: I’m curious as to the experience using PS Vue with a Fire TV Stick (using wifi) rather than the more capable Fire TV box (using ethernet). Any problems with the UI lagging or with the video stream buffering using the Stick? @Tim I can speak a bit to this. The stock is atrocious. I have the latest stick which I think had a slightly better processor than the first generation. My kids room has a first gen Fire TV proper. It’s acceptable but not great. I’m on the way to the airport to get back home but Amazon just delivered the latest gen Fire TV which i expect to be good if not great and the fire stick goes back in my suitcase for hotel use. @Dave Zatz, that’s a great CNet article and the most comprehensive one I’ve seen to date. One thing they got wrong, at least in the FireTV device, is they said there’s no 30 second skip, which is true, but there is a 10 sec skip when you use the navigation ring. Just push the ring on the left side for reversing 10 secs and to the right to FF 10 secs. It’s actually VERY responsive for me and maybe even faster than my TiVo when scanning through commercials (not if it has skip mode course), but it takes practice and finger speed. I just hit the right side ring 9 times for 90 sec commercials, 12 for 2 mins, etc. I do it really fast and it remembers how many times I press so it’s just a matter of waiting for the video to reappear and catch up, which is pretty minimal. Using the FireTV box with wired ethernet is by FAR the best device to use for a great Vue experience and has the best WAF too. But frankly, I could just use the OTA tuner in my TV for live TV and then commercial-free Hulu for on-demand content from the major networks (except CBS and PBS, which I could access through Plex). I’m not someone who saves up a whole season of a series to binge watch. I don’t like doing that. In fact, if I do that, I feel overwhelmed by the number of hours to watch and I’m likely to just forget the show and move on to something else. Quick update now that I’m home and have the new Fire TV 4K installed. 2) Original Fire TV: not bad. Just fine for most things. 3) New Fire TV: wow! But yesterday on my U-Verse (45mbps, 30 ms latency when it worked) everything but the guide was anywhere from fast enough to impressive. Live streams started quickly and looked great. FF/RW was just fine and I like the quickness of doing multiple 10 sec FFs to get past commercials. Wish it was 30 forward and 10 back but the speed was good. Today, we have Comcast 100mbps with 12ms latency and I suspect everything but the guide will be even snappier, probably due to the latency. Yeah, Fire TV Stick is too sluggish across the board – I’ve unloaded two and would not recommend unless it’s for a kid’s room or kitchen or something. There’s only one version as far as I know, although two remote controller options these days. That said its still my travel choice, sluggish or not. Has Amazon, Hulu and Netflix, plus now Vue, and most importantly a web browser to sign in to hotel WiFi. Plus Plex. The Fire TV stick is sluggish to be sure. But I think it is good enough. That said, I am looking at getting a Fire TV box for the wired connection. For what it’s worth I also tested Vue with a Chromecast and found the Fire TV stick to be better. The Chromecast would lose it’s connection and I’d have to reconnect to the device. Meanwhile the video would continue to play. There was just no controlling playback. A wired connection is always better. I just ordered a FLIRC dongle and a Peel remote. The FLIRC will let me control the Fire TV from the Peel, and if I don’t like the Peel (it was cheap) from an older Harmony remote I already have that is a bit long in the tooth, but works. Anybody know if you can use a FLIRC adapter on the stick out of curiosity? A micro USB OTG cable will make the connection, but I don’t know if that port has a host profile to support USB devices, or if it’s literally just for power. The Internet seems a bit sketchy on both details and people who’ve tried it. AFTVNews has the answer. You have root. So incidentally although I haven’t played with rooting my stick yet, I did get FLIRC working with a Peel remote on IOS. It’s clunky since you seemingly can’t add anything custom. So I basically added a remote for a device I don’t add, and then used Peel itself to program FLIRC. Then under ‘custom remote’ I napped out all the Fire TV buttons. But now I have this tab with a device I don’t own. Zero wife acceptance here. So next step Harmony. lol HGTV is strangely addicting.